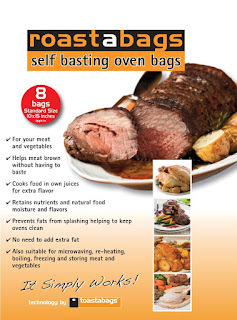 #Roastabags Have you ever spent a few hours roasting a beautiful roast and it smelled so good, you couldn't wait to eat it, and when it was finally done it was tough and disappointing? That won't be the case with Roastabag Roasting Bags for Chicken and Meat. They baste the meat as it cooks, keeps all the moisture contained in the bag for a delicious, tender result. No need for extra fat, plus the bag keeps fats from splashing keeping your oven nice and clean. Makes clean up a lot easier too. Nothing is stuck on or burned in your pan, all the juices are contained in the sealed bag. These bags can be used in the microwave too or for reheating, boiling, freezing and storing meat and vegetables. I want to keep these on hand! No more dry tough meat in my kitchen.